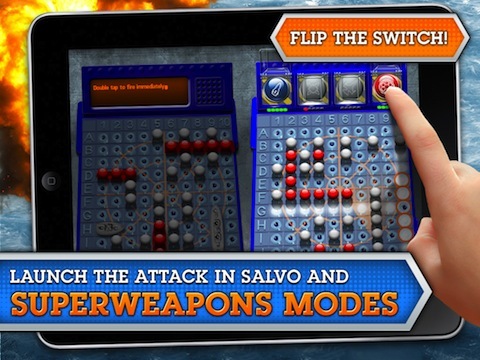 BATTLESHIP for iPad is the newest offering from Electronic Arts in the App Store. With it’s faithfulness to the classic board game, two alternate game types, and multiplayer action with friends, this game will have you screaming “You sunk my Battleship!” in no time. Battleship on the iPad looks and feels like the traditional board game offering from Hasbro, but punched up with visually appealing cut scenes and graphics for the iPad. If you’ve played the iPhone version of BATTLESHIP, this will feel very familiar. My favorite mode is the old standby, classic. Played just like the “at-home” version, you begin by hiding your five ships, and then alternate “firing” shots at your opponents board by guessing squares on a grid — scoring a white peg for a “miss” and a red peg for a “hit”. Be the first to sink your opponent’s five ships and you’re the winner. EA also offers two tweaked version to the classic game, the first of which is Salvo. In Salvo, each player fires as many shots as they have ships still remaining. So if you have all five of your ships, you get five shots — but watch out, once you start to lose in this mode it gets tougher to come back because you have less shots than your opponent. The other gameplay tweak is Superweapons mode, where in addition to the traditional shell shot, which targets a single square, you can equip your ships with three additional “superweapons” which launch various patterns of shots, protect your ship, or even add extra ships to your fleet. These modes offer a nice variation on classic mode, and forces you to take a new approach to this classic game. Battleship for iPad does offer one nice upgrade from the iPhone version, and that’s side-by-side multiplayer. The first player selects their ship location while the second player looks away, and then the first player looks away while the second player places their ships. Once all the ships are placed, the screen just shows the hit/miss map so both players can look at the screen at the same time. You can choose to hold the iPad between the two players, pass it back and forth, or set it on the table and sit on opposite sides and one side of the screen will flip and face the other direction. 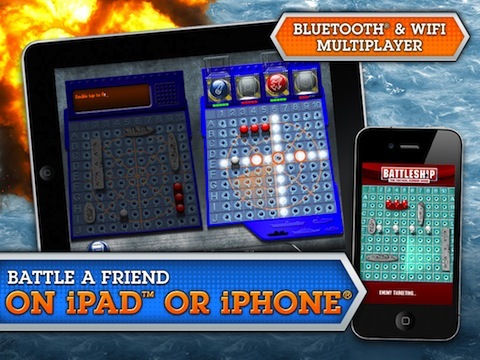 Overall, BATTLESHIP for iPad isn’t a very deep game, but if you like playing BATTLESHIP, you’ll like it on the iPad. It’s fun, it’s simple, and it’s a good two-person local multiplayer game. Battleship for iPad can be purchased for $2.99 in the App Store. AppSafari review of BATTLESHIP for iPad was written by Alex Seiver on June 24th, 2011 and categorized under App Store, Board, Games, iPad apps, Strategy. Page viewed 6067 times, 4 so far today. Need help on using these apps? Please read the Help Page. Please bring this game back! I had it a long time ago and I loved it and I want it again! Please revive this game for the Canadian market!